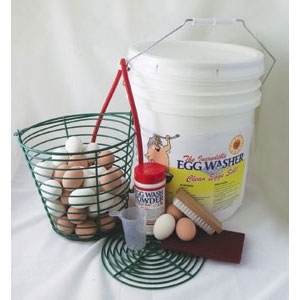 Tired of washing all those eggs? This unit washes approximately 8 dozen eggs in a maximum of 15 minutes. Eggs are gently bubbled clean. No moving parts to wear out. Connects to any air compressor (recommended 2 CFM) or purchase compressor below. Our new design black egg baskets will not fit the Incredible Egg Washer. Do you need some special expensive detergent or is this something that the soap I'm using by hand will work? It is recommended to use a egg wash powder. Hello, I was looking into this egg cleaner. What P.S.I. would it be? And also if the shells start getting thin will this mechine break a bunch during the cleaning process? And finally do the eggs need to be cleaned a.s.a.p. or if the manure dries will they have to be hand washed? Thanks for your time. It would be 30 PSI or 2 CFM. It shouldn't break the shells, but it may depend on how thin they are. The machine gently bubbles the water to clean the eggs. You do not need to clean the eggs immediately, they should be washed before consumption. But if they are very soiled, you may want to wash those right away.